Scott Wright has left on loan for Dundee. 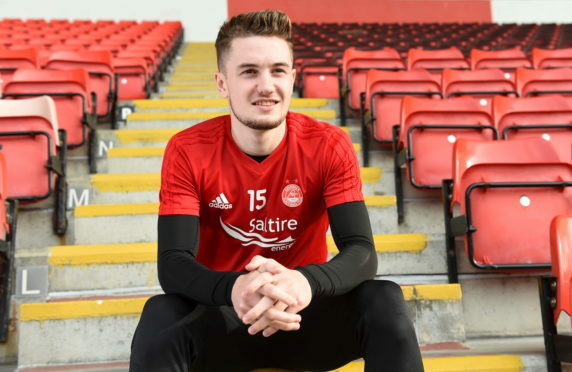 The 21-year-old, who impressed in the Dons’ 4-1 Scottish Cup victory over Stenhousemuir on Tuesday, became the Dens Park club’s 10th signing of the transfer window last night. Forward Bruce Anderson also went out on loan, joining Championship side Dunfermline Athletic for the second half of the campaign. Wright said: “I am looking forward to going down there and getting started. I will hopefully come back a better player for Aberdeen. The manager has said to me that is the bigger picture. Anderson, who has scored three goals in 18 appearances for the Dons this term, has been sidelined recently with shoulder and calf injuries. He said he “couldn’t wait to get started” after joining the Pars. Dons manager Derek McInnes felt both players would benefit from the moves. He said: “I think it’s the right move for Scott at this stage and a great opportunity for him to gain experience which will be invaluable in his future AFC career. Aberdeen’s Bruce Anderson (L) has moved to Dunfermline on loan. “The hope is he’ll come back to us fully equipped to deal with the demands of our team. Bruce is someone we have high hopes for, and I believe this loan spell at Dunfermline is the right fit for him and will provide a real opportunity to get some first team football. The Dons looked set to hold on to defender Scott McKenna and Gary Mackay-Steven as the transfer deadline approached last night. Reports of a £7 million bid from Stoke City for McKenna were wide of the mark, while the Dons rejected an offer from MLS side New York City for winger Gary Mackay-Steven. New York have already made an approach to speak to Mackay-Steven about signing a pre-contract agreement.